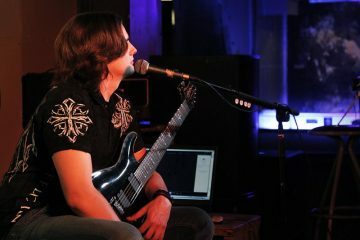 Gus Drax is a guitarist from Greece and plays in the Greek bands Sunburst, Black Fate and theUK based band Biomechanical. 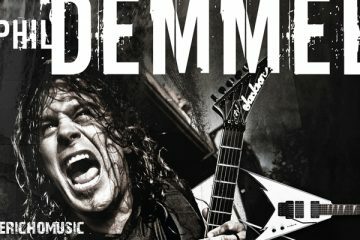 Gus Drax has also released a solo album featuring on somesongs Steve Smyth (who also played in Nevermore) and Bob Katsionis from Firewind. His work so far has given him a place among the best guitarists in Greece and of course he is starting to get recognition outside Greece as well. Unfortunately the attendance was a way too low, especially if you consider the low price (5E) and the fact that Gus Drax is a very technical but also melodic guitar player so it was a good chance for guitar players especially to resolve many worries about techniques and also about composing. It was nice though to see some well known musicians of the city at the event, such as Kosta Vreto (of whom Gus is a great fan as he told us), Stergios Kourou and Yannis Papadopoulos of Wardrum, it is important that one artist supports another at such events. It must have been around 6.30 when Gus Drax finally got on the stage of “Fix in Art“, welcomed us and thanked everybody for coming. Gus had brought 2 guitars with him because of the different tuning of the songs and he told us that he would first play with the one guitar songs from his personal record and then songs from his bands and of course answering question in between the songs. He continued with “The Symbol Of Life” (Sunburst) which I personal love, he also informed us that he will be with Sunburst in studio in May and after that another solo album will follow. He introduced us to the funky tune “1000 Nights” saying to us he could not understand why it is not among the more popular songs of the album. He played also “Hourglass“, “In the presence of the Dead” and closed the first part of the clinic with my favorite tune from his personal album “In Loving Memory“. This tune is very melodic and very touching and has some great vibrato in it, so one of the audience’s questions was about vibrato and Gus told us about guitar players with great vibrato, such as Gary Moore. 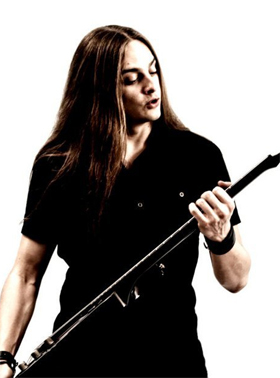 He also told us all his influences; first of all John Petrucci (he told us not only in playing but also in composing) Michael Romeo, Jeff Loomis, the Cacophony duet Jason Becker and Marty Friedman, Chris Broderick and he told us that in his opinion the most underrated rock metal guitar player must be Chris Oliva (RIP) and I agree completely with him. He answered also questions about his picks his pedals and his guitars. Gus also answered questions about the differences of the crowds during live shows in different countries, how it goes with teaching people of all ages guitar and what hard work and sacrifices it needs to become a professional musician. He then played “Perfect Crime” (Black Fate) “Regenerated” and closed the clinic with also one of my favorites from his personal record “Vitality“. After almost 4 hours, Gus thanked us once again for coming and promised that he would this again. The only thing I want to add is that it is a shame that such great guitar players and guys like Gus Drax do guitar clinics for almost free (5E entrance) and the attendance is so low. Let’s hope that next time it will be different. Nevertheless it was a great experience to see this guy play live and to get many of your guitar worries answered. Really looking forward to hear some new material from Gus Drax soon!